A streamer tied in the Rangeley style. I chose the feathers because they appeared to work so well together. When the fly was completed it looked like cotton candy. For those interested in streamers, I have a few sites for you to check out. Jeanette and I took a few days to enjoy some quiet time on Cape Cod. There are no crowds at this time and the weather was nice. We're not swimmers so it did not matter what the water temps were. We walked a long stretch of beach, and saw but a handful of people. It's at times like that you are able to think with a clear mind. We also spent some time walking, and fishing a wonderful stream that has a special place in our hearts. "Red Brook". This stream is a place where searun brook trout live. 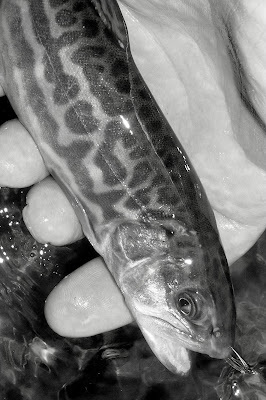 These remarkable fish exist in but a precious few streams as they did when the Pilgrims first landed. It is to the hard work and resources of many dedicated people that they are doing well, and are protected in this environment. While the fishing was spectacular, the catching was tough. There were hits, a few hookups, but only one came to hand. My belief was they were quite far upstream, spawning. While I fish from the banks, the stream is quite thick with brush upstream, making it difficult to access. While returning home we stopped at Bass Pro Shops Outdoor World in Foxboro. Fellow blogger Bruce Weaver, his blog is "Outfitted For Life". He is an associate in the fly shop there. We stopped for a spell and chatted. His fellow associate, who's name I can't recall, was a member of TU who's chapter is responsible for the Red Brook restoration. He told us a story of a brook trout. 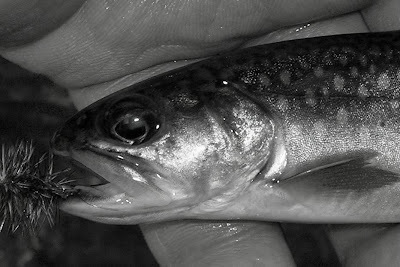 Some of these trout are fitted with tags that can be followed by satellite. This one trout was tracked in the Cape Cod Canal, not once but twice. This is quite remarkable because that is quite far from the little stream, and full of predators such as bluefish and stripers. 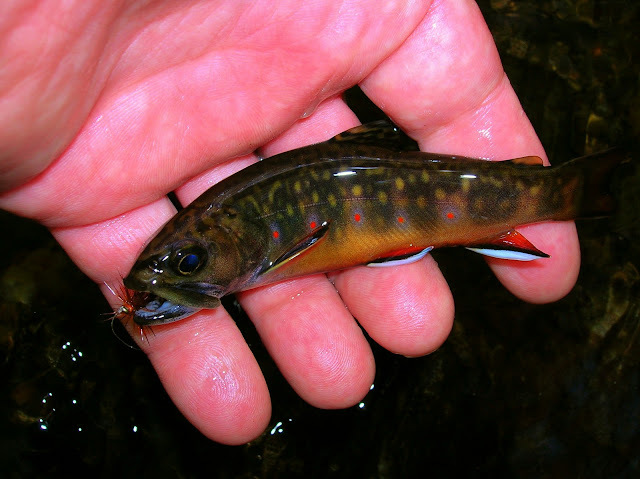 Those that live close enough to this area should visit this little stream, and witness these special brook trout. One of Red Brooks precious residents. A quiet lunch, and a toast to a special stream. Well plans have been completed to spend some time on Cape Cod. An opportunity to do some hiking and fishing. There are a few streams I enjoy, one of them or perhaps both will give up one of its "Salters", a sea run brook trout. The changing of the shoes....a new pair of hiking/walking/waders. LL Beans, Trail Model Hikers. Super Quality, Beans guarantee, and only 59.00. I made a New England favorite, Chicken Pot Pie. Some warm comfort for these autumn nights. Lots of chicken, vegetables, and a puff pastry crust to soak up that gravy. There is a little camp that sits on the carry road at Upper Dam, Maine. 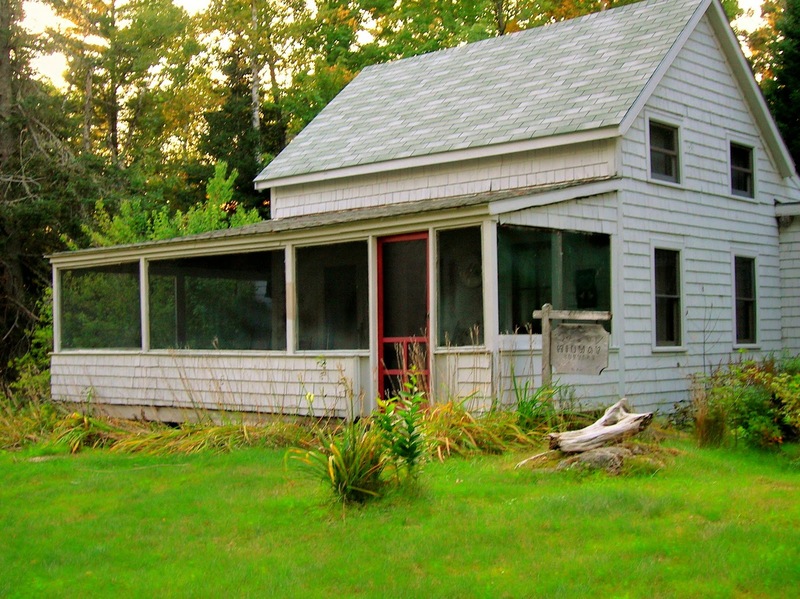 In this cottage in 1924 the wife of a Maine guide tied one fly fishing's most recognized items. 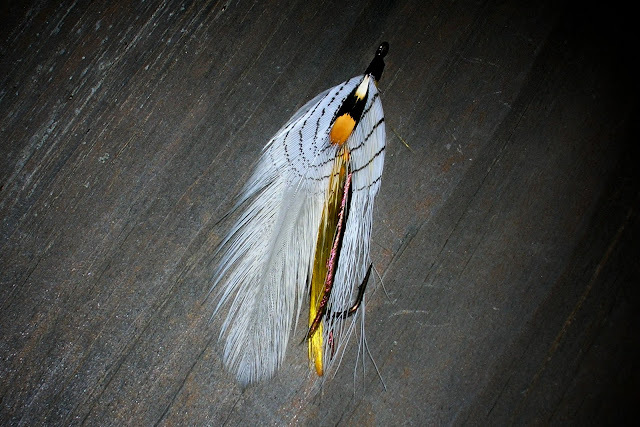 The "Gray Ghost" streamer. 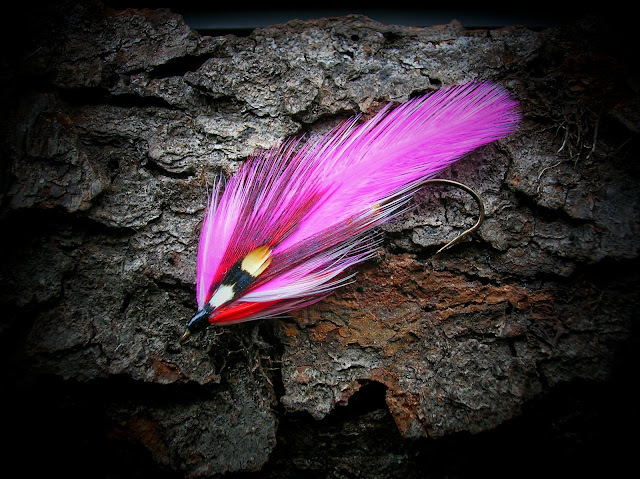 I know as a starting fly fisher it was one of the first flies I purchased and fished with. It was a productive fly then and continues to be to this day. From what I've read on the history of Carrie's streamers the Gray Ghost was not her first streamer, and I know it was not her last. But I believe it to be her finest. This plaque sits right across from the little cottage where the Gray Ghost was tied. I tie many streamers, most of them of my own thoughts. I believe they are a form of art, and are beautiful to look at. But this is a true classic. It's been tied in so many ways, that some of them in fly shop bins don't even look like Carries original. I have tied this "Gray Ghost" exactly to pattern as she tied it in 1924. For the last several days I have been out wandering a few small streams. The country is alive and vibrant with color. Color which seems to fading with each day. The streams are full of crystal waters, flowing cold, and in places deep. These deep pools are holding residents waiting to start a new life cycle. There are a few who's colors rival natures unframed artwork along the stream. And if I'm quiet and stealthy enough I may be fortunate enough to handle one of Autumns Treasures. A small tributary, who's waters have flowed throughout the year. Although somewhat small and narrow at it's meeting with the larger stream, further walking upstream brings about a larger somewhat wider waterway. Being a bit over grown with brush, providing shade to help cool and conceal its residents. The "Picket Pin"..this old wet fly was the choice for this small stream. Size 12 and 14 are the most productive for me....14 being best. As I sent the wet fly on its ride, being a short one on this stream, it stopped, yet the fly line continued. I thought a snag, but as I pulled the line towards me I felt the weight. 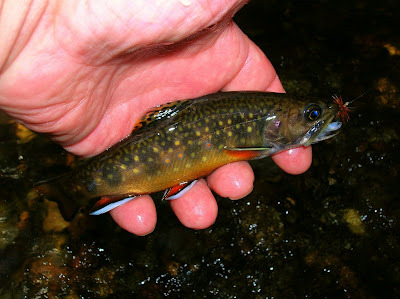 The brook trout ran up and down the little stream, causing me to do some jumping to. In the end I was able to meet the trout. I admired him, and off he went. As I reached what to be the widest part of this stream, the Picket Pin and I were given the pleasure of few more of Autumns treasures. There are but few days left on the calendar that give this angler the opportunity to seek the brook trout in natures finest time. They are in my minds journal, to be retrieved on a cold, snowy day. 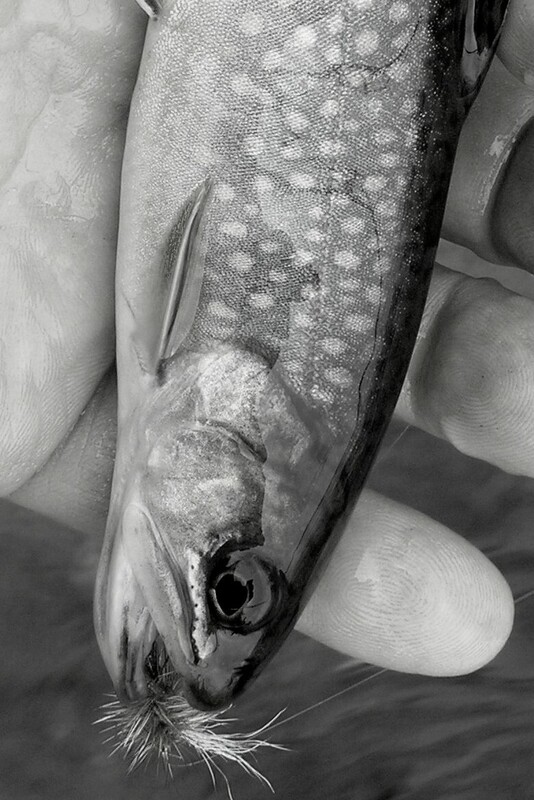 Pursuing Wild Trout, is a book that tells of a wilderness in northern California that is home to wild trout. It's well written, and is an easy read. I bought this book maybe twenty years ago, and still pick it up from time to time to reread parts of it. Mark, at Northern California Trout might have some knowledge of this area. This is a companion of mine. He comes with me on all my outings. 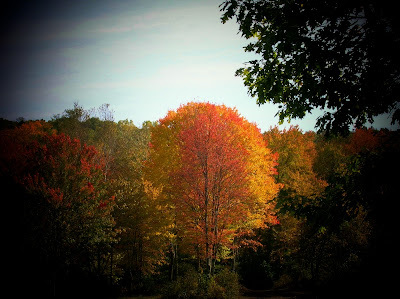 I love stuff like this.... this one is from Great Barrington, MA. It's awesome. 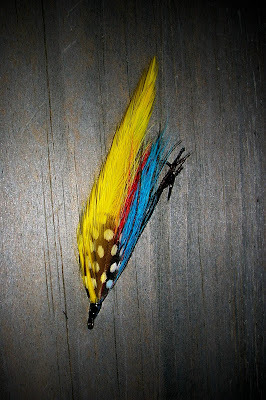 The "Picket Pin" a wonderful little wet fly. I have carried this fly for a lot of years. I used this fly yesterday and I'm going to use it again today. The report will come on its performance. This is the apple harvest time in New England, so....... "Apple Walnut Bread"
Over the Columbus Day weekend I fished several streams at various times during the day. I find that fishing from that 9am to 3pm works best for me. At that time the sun is out and the fish seek shadows, which are easy to locate thus finding fish holding areas simpler. This stream is a freestone that was running pretty good for this time of year, we've had ample rainfall this year and the streams are full. The large boulders in the stream always make me think when they were deposited there. Were they placed there by man, or did the glaciers of the last ice age deposit them there. I started fishing a Bomber dry drifting it in likely areas that I knew might hold fish. It soon produced a rise, but the fish did not want to eat it. This has happened a lot these last few weeks with this pattern, it's as if they just want to play with it. 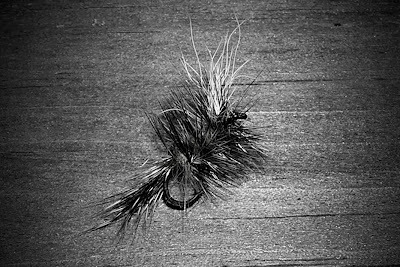 I tied on a Clown Shoe Caddis, still not tied to pattern, but I'll get it right soon. Well that fly worked for me for those few hours I fished. The fly was hit at the end of the drift, just as it stopped and was sucked under. 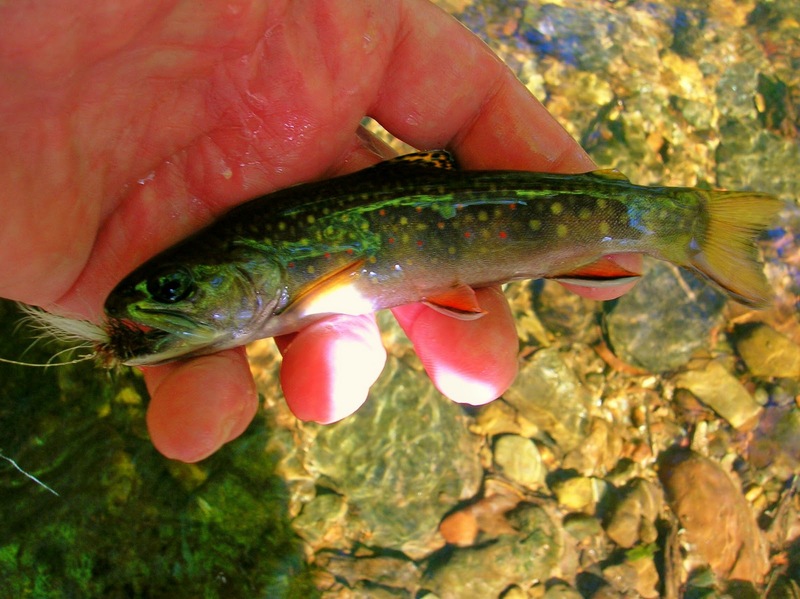 The brook trout that day looked like the foliage around the stream. Large boulders make for some wonderful holding water. 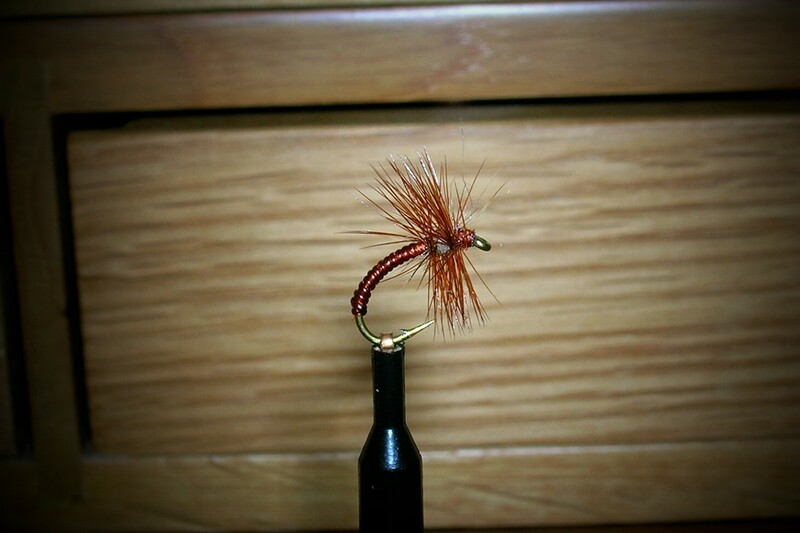 Here's that not tied to pattern Caddis. Another survivor from the ice age. 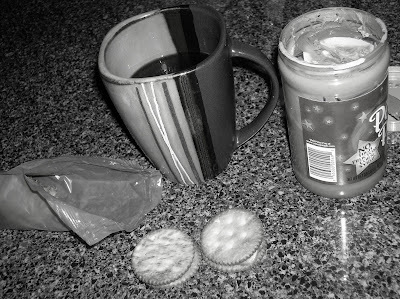 Images in black and white.... old school photography. Images that appear to be made of steel. Images that are dark, and appear to be unreal. Images of objects that are so full of color, now are in a form of lifeless reality. They are beautiful in there two tone color...Black and White color. They have a soft shine to them that no color can match. I hope you can see the simple beauty in them, and enjoy. Saturday morning found me visiting a stream that I truly love. It winds over some rough land but has some smooth spots that are easily negotiated. 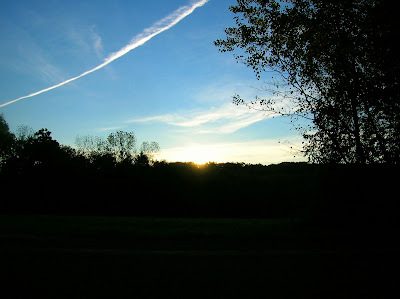 The morning was crisp with frost all over, and the suns rays filtering through felt good. It's funny how the mind works. The suns warmth could not be felt, yet knowing it was coming through made your body feel warm. As I walked this little stream, looking into its pools, which were not very deep, I wondered has I have so many times, how can a trout with such vivid colors go unseen until they dart away. I walked and fished this stream for a few hours and it was kind to me. Not once did my hiking boots feel the cold bite of the stream. I remained dry which is unusual for me. It also gave up some of its wild jewels to The Bomber and me, allowing a few to come to hand to admire their beauty. 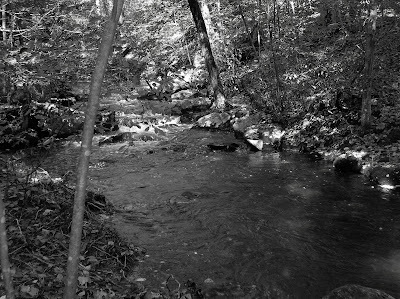 A small stream. An October morning, the fresh smells of a mixed forest.... can it be better? Bridges and the pools under them are favorite places for me. It seems that the pools under them almost always hold a trout or two. And though I'm aware of this possibility, I'm always shocked when the fly is taken, and most times loose the fish. Dave Footer is an artist, and taxidermist. 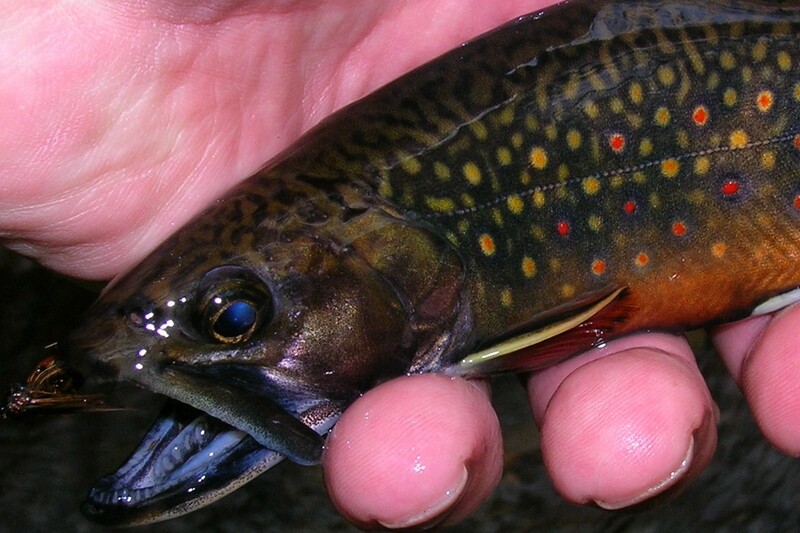 He is a man who has guided fisherman into the wilds of Maine, and Quebec, in search of brook trout. 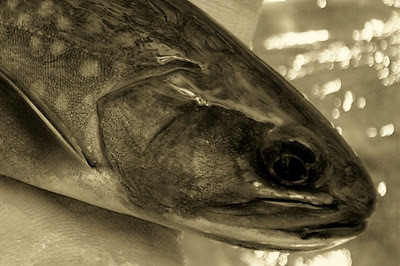 My first encounter with Dave was in the late 1970's, when while fishing Mooselookmeguntic Lake in Maine, my brother in law caught a landlocked salmon of generous proportions. We went back to camp, which was on Haine's Landing, and asked about having the salmon mounted. Almost everyone suggested Dave Footer. The fish was taken to his studio in Lewiston, and was mounted. The salmon is in my brother in law, John's home, and looks as good as it did when taken back a long time ago. 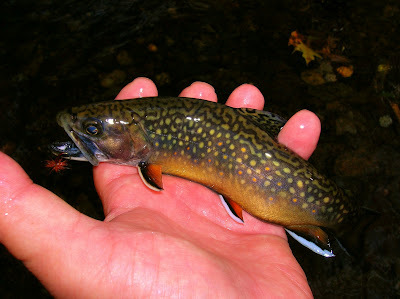 About 25 years later, while fishing a tributary to Rangeley Lake, I was fortunate to catch my personal best brook trout. I knew what I wanted to have done, and who I wanted to do it. Dave's wife. She is a very knowledgeable and told me all about the process of a Footer mount. While taking the info from me on the fish she showed me around Dave's studio. 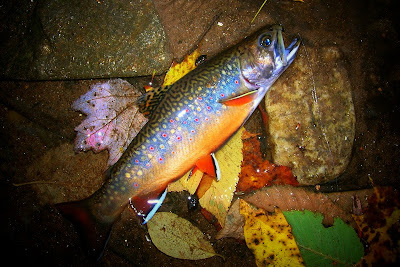 There were beautiful paintings of brook trout all over. And oh so many fish. Work that was being done for anglers from all over the world. Well one year later I received my mount from Maine and was impressed with the results. The man is said to have mounted over 6000 fish, most of them brook trout. And many fish restorations, as well as fish paintings. 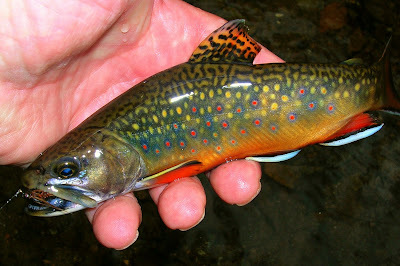 An artist who was taught by "Herb Welch"
Dave Footer doing a brook trout painting. Dave and his family, all of them involved with with the business of fish mounting and restoration. A self portrait of Dave. Two of Dave's fine mounts. The "Footer Special" a streamer created by Dave. It is a very effective streamer for brook trout. This one from his studio and well used. It now sits in a plastic case, fully retired.